Are you a pie person? I have found that there are pie people in the world and there are cake people and both hold strongly to their opinions! 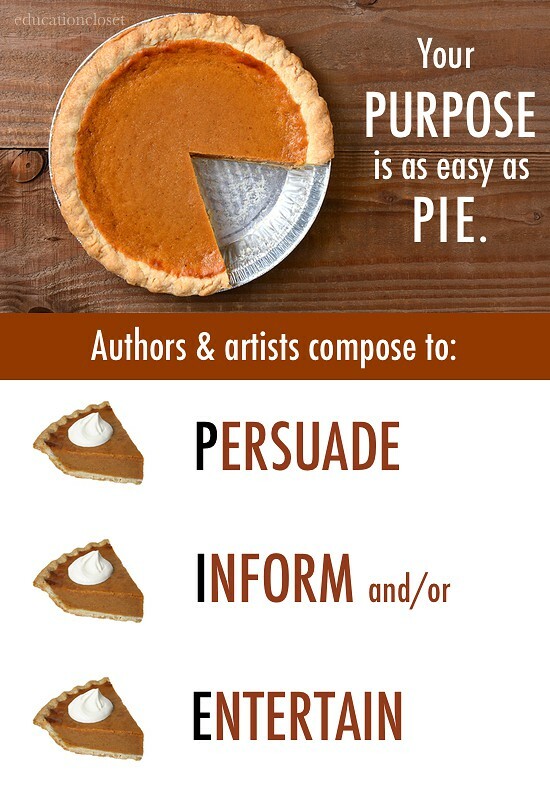 Today though, I hope that even if you’re a cake person (like me – with buttercream frosting), you’ll try out the PIE strategy in your classroom with this Author’s Purpose. All successful authors and artists use one of three main foci when writing, composing or creating. They are either trying to Persuade, Inform or Entertain. We actually see this a lot in social media. Think about what you share most on your Facebook wall, what you Tweet or what you Pin. Probably 95% of it fits into one of those three categories. When our students are working on their written or artistic compositions, having a clear purpose is extremely important. Not only that, but if students are looking for their work to have an impact on others, they need to consider which of the three categories they are writing or composing FOR. Side note: not all compositions are created for others. Many times, writing and the arts are for the self, and that is perfectly fine. If that is the purpose, we just make PIE plural (PIES). Today’s freebie is meant to help your students think through the purpose of their composition in any area and refocus their efforts to ensure it is framed for their intended audience. This is also a great tool for analysis of an author’s purpose/artist’s purpose when reading, listening, or viewing a selection. No matter what your personal preference this New Year’s Eve, bring out the PIE(S) in your classroom. And…save a slice for yourself – you’ve earned it! PS – this is a sneak peek of what we send our newsletter subscribers each and every Sunday. Like it? Subscribe!